These mixing valves are new and complete other than missing the half of the union that attached it to the manifold. Complete with check valves and rubber union washer they are great for replacing a defective mixing valve already installed. High grade hardened steel. Step Clamp 25S-38, 40S-38, 60S-38, (2pcs Each size). Stud size: 3/8"-16. 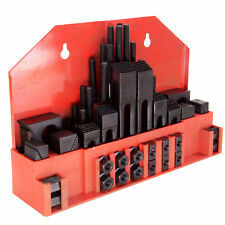 Includes: 24 studs (4 pieces of each 3",4",5",6",7",8" long), 6 step block pairs. Setp Block: STB-1, STB-2, STB-3 (2pcs Each size). Delta 060294A Wall Mount Foot Pedal Cartridge Faucet Repair Kit ! NEW ! Delta 060047A Right Hand Brass Cartridge Structure Faucet Kit Hot ! NEW ! Parker P3NKA00RL Lubricator Body Service Kit ! WOW ! Premium Quality Heavy Duty Flexible Rubber Couplings for Cast Iron, Plastic or Clay Pipe Connections Ideal for fast permanent pipe repairs Please select the size and fitment type you require Same great quality as Fernco Products at much better price!!! PLEASE NOTE INTERNAL DIAMETERS 1.5" = 47MM INTERNAL DIAMETER 2" = 60MM INTERNAL DIAMETER 3" = 88MM INTERNAL DIAMETER 4" = 114MM INTERNAL DIAMETER 6" 185MM INTERNAL DIAMETER Brand New Unused This item size is 4" Please be aware that a 4" coupling fits 4" pipe which means the internal diameter is a little over 4" as it takes into account the thickness of the pipe wall as well as the bore size. Master Plumber W-2K Faucet Repair Kit ! NEW ! MPN: 060683A. Sale Quantity: 1 (one). Nothing else is included unless otherwise stated. What is pictured is what is for sale. ZURN INDUSTRIES. Material of Construction : Plastic. Hands free motion sensor faucet. Battery operated. The Wilkins Model ZW1070XL Aqua-Gard Thermostatic mixing valve is designed to be installed at the point of use to assist in the prevention of scalding. Lead-Free FNPT Aqua-Gard Thermostatic Mixing Valve, For Sensor Faucet. BrassCraft Faucet Repair Kit for Peerless Single Lever. Item# 0445. We will work with you. You deserve to be treated with 5-Star Service! Allow us the opportunity to correct any mistakes that may have occurred. Fernco Flexible Couplings have found wide acceptance among sewer and plumbing contractors and municipalities because of their quality and ease of installation. Fernco pipe couplings and adapters are used for all types of in-house and sewer connections: drain, waste, vent piping, house-to-main, repairs, cut- ins, conductor, roof drains and increasers-reducers. 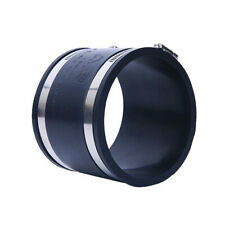 Manufacturing thousands of different flexible coupling types, Fernco has the right solution for most applications. Made of tough elastomeric polyvinyl chloride (PVC), the flexible couplings are strong, resilient and unaffected by soil conditions. They are also resistant to chemicals, ultraviolet rays, fungus growth, and normal sewer gases due to the inert nature and physical properties of the PVC material. Item# 0231D. BrassCraft Aerator-Polished Brass 15/16"-27 Male Tread. Genuine Delta Manufacturer Repair Part. We will work with you. Part# RP330PB. You deserve to be treated with 5-Star Service! Allow us the opportunity to correct any mistakes that may have occurred. Item# 0573. We will work with you. You deserve to be treated with 5-Star Service! Allow us the opportunity to correct any mistakes that may have occurred. We look forward to serving you. We're here to help in any way we can. Item: 3545. We will work with you. (Lot of 3). We're here to help in any way we can. You deserve to be treated with 5-Star Service! Allow us the opportunity to correct any mistakes that may have occurred. BrassCraft Repair Kit. Item: 0652. For Sterling Single Lever. We will work with you. You deserve to be treated with 5-Star Service! Allow us the opportunity to correct any mistakes that may have occurred. BrassCraft Faucet Seats. Item: 1157. For Kohler. Size: 1/2" x 27 Thread. We will work with you. You deserve to be treated with 5-Star Service! Allow us the opportunity to correct any mistakes that may have occurred. BrassCraft Flat Faucet Washers. Item: 2105. We will work with you. You deserve to be treated with 5-Star Service! Allow us the opportunity to correct any mistakes that may have occurred. We look forward to serving you. We will work with you. You deserve to be treated with 5-Star Service! Allow us the opportunity to correct any mistakes that may have occurred. We look forward to serving you. We're here to help in any way we can. GERBER COLD HEX HEAD. BEST PLUMBING. UNUSED SURPLUS. Delta Handle Repair Kit 07191 Lot of 3 Mark's Parts. For Single Lever Valve. JustRite Self Closing Faucet 08031. Gas, Oil, Kerosene, Turpentine, Fuel Oil. 053363 SEXAUER. Rebuilding Kit for Quaturn Faucets. of All Types and Models. BrassCraft Faucet Repair Kit for Delta Single Lever. Item# 0120. We will work with you. You deserve to be treated with 5-Star Service! Allow us the opportunity to correct any mistakes that may have occurred. For Streamway. BrassCraft Hot Stem. Item# 0510. We will work with you. You deserve to be treated with 5-Star Service! Allow us the opportunity to correct any mistakes that may have occurred. We look forward to serving you. Relief Valves. Flow Indicators. Line Reactors. Hand Tools. Safety and Security. Rotary Lobe Blowers. Roller Chains. Diverging Valves. BrassCraft Mfg Hot/Cold Stem. Item# 5322. For Price Pfister. We will work with you. You deserve to be treated with 5-Star Service! Allow us the opportunity to correct any mistakes that may have occurred. Item# 0568. BrassCraft Cold Stem. We will work with you. You deserve to be treated with 5-Star Service! Allow us the opportunity to correct any mistakes that may have occurred. We look forward to serving you. Model: 54851 01. Boston Gear Repair Set. Model #: 650PVC. Keeney Complete Schedule 40 Bath Drain Kit. 1-1/2" PVC Pipe Schedule 40 Tube, Fits All Standard Size Tubs, Includes Everything Necessary For The Installation of One Complete Bath Drain. BrassCraft Wall O-Rings. Item# 0535. Size: 10mm I.D. (13mm O.D.) x 1.5mm. We will work with you. You deserve to be treated with 5-Star Service! Allow us the opportunity to correct any mistakes that may have occurred. BrassCraft Beveled Faucet Washers. Item: 2106. Size: Trade Size: 1/4 (Actual O.D. Size: 9/16"). We will work with you. We're here to help in any way we can. You deserve to be treated with 5-Star Service! BrassCraft Rectangular Cam Assembly. Item: 0153 (SL0153). For Delta (Single Lever). We will work with you. You deserve to be treated with 5-Star Service! Allow us the opportunity to correct any mistakes that may have occurred. Item: 0114. We will work with you. You deserve to be treated with 5-Star Service! Allow us the opportunity to correct any mistakes that may have occurred. We look forward to serving you. We're here to help in any way we can. Handi Tap Faucet Sink Valve. Bradley S65-063. If you live in a bad neighborhood I suggest you get a PO box. Repair Kit. Genuine OEM. I do this because I know you will get it faster! 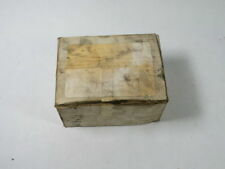 Do not make an assumption as to what you think the item is, ASK BEFORE YOU BUY. 1PC Short Path Distillation Head, Vacuum Jacketed, 24/40. 1PC Distillation Cow Receiver, 1-to-3, 24/40 1. 1PC Round Bottom Flask, 2L, 2-neck, Hand Blown, 24/40 Joint. 2PCS 500mL Round Bottom Flask, 500mL, 1-neck, Hand Blown, 24/40. This Auction is For 1 ROCKWELL No. 147 Size B Permaturn Valve Sealant 24 Sticks [[Best Offers Usually Responded to within 24 hours. We are a seller and buyer of industrial equipment with over 35 years experience. Purchase our products with confidence. Contact us about all of your industrial equipment needs: All best offers on Ebay will be responded to within 24 hours.. Thanks for looking! Our Policies: 100% Customer satisfaction! We gladly accept PayPAL and payment on pickup.